I am glad to inform you that the 14th Annual Convocation of KIIT Deemed to be University for all the graduating students in the Academic Session 2017-18 will be held on 10th of November 2018 at 10.00am in the University campus. I extend to you our most cordial invitation to attend the convocation and advice to receive your degree in person. A full scale rehearsal of the function will be held on 9th of November 2018 at 3.30pm. I wish to emphasize the participation in the rehearsal and registration within the due date is mandatory for receiving the degree in person. Already Registered? Download your filled form below. If you have any enquiry or facing any issue please fill the form below. The 14th Convocation of KIIT University is scheduled on 10th November, 2018 at Kathajori Campus, Campus-3 from 10:00am onwards, wherein the degrees will be conferred on the graduating students and University medals will be awarded to the toppers of various programme. The graduating student has to register for attending the convocation. The ONLINE registration can be made at kiit.ac.in (http://convocation.kiit.ac.in/convo/) with payment of convocation fee of Rs.1,000/- (either online payment or DD in favour of KIIT University, Bhubaneswar payable at Bhubaneswar). The students making payment through DD is required to send the downloaded filled in registration form and DD to “Office of the Registrar, Campus-4, Chintan Building, KIIT University, Bhubaneswar-751024”. The graduating students should ensure the clearing of all institutional dues to the University, before registrations. The students whose applications are not received by the due date will not be allowed to attend the Convocation. 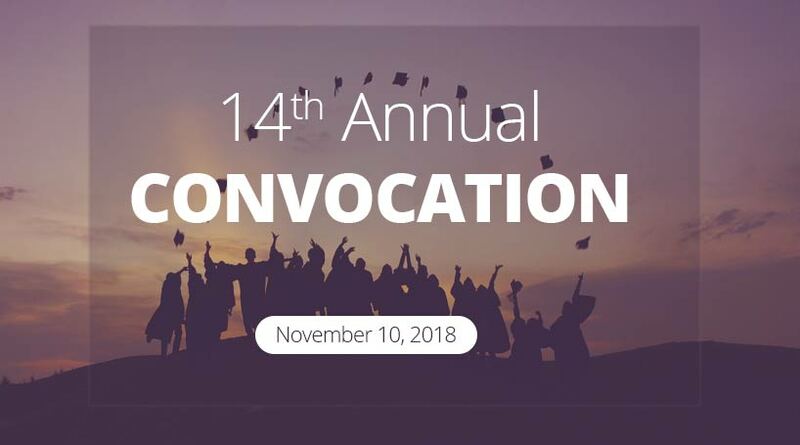 The registered student has to attend the “Convocation Rehearsal” on 9th November, 2018 at 3.00pm at the Convocation Hall and collect detailed instructions on the conduct of the convocations. The confirmed student will be issued with Convocation Kits on 10th November, 2018 from 7.30am to 9.00am at Convocation Venue, with due verification of the institutional dues and payment of convocation fee. The student will be seated in the allotted seats only. Entry to Convocation Hall is restricted till fill up of seats. The others will have to seat in the parallel venue, from where they will be allowed to entry into the Convocation Hall as per sequence of the program through side gate. Male: White shirt, black/grey trousers and blazer or suit with tie and black shoes. Female: Indian Dress Code (Salwar Kameez/ Saree). Shawls/Stoles are not permitted. Flowers, Handbags or other articles should not be carried during the convocation ceremony. Since storage facility is not available at the venue, the students should leave those items at their conveniences for safe keeping. All eligible students will be issued gowns/scarf at the designated counter and they will wear it throughout the ceremony. Gowns/scarf will be returned after the convocation on the same day at designated counter. The student without Gown/Scarf will not be permitted to attend the convocation ceremony in person. The registered students should be seated in the Convocation Hall on 9th November, 2018 by 3.00pm for rehearsal and instructions. The students should be seated in the Hall on 10th November, 2018 by 10.00am for the Convocation Ceremony. No entry will be allowed thereafter. Once seated, there should not be unnecessary movements in the Convocation Hall and perfect discipline ought to be maintained. The recipients can’t leave the convocation hall before the function is over and the academic processions leaves the Hall. The recipients should make their travel plans keeping in mind that the Convocation will not be over before 2.00pm. Entry for Rehearsal	2.30 p.m.-3.00 p.m.
Rehearsal & Convocation Instructions	3.30 p.m.-4.30 p.m. Entry to the Convocation Hall & be seated in the Hall	9.00 a.m.- 9.30 a.m. The recipients will take their seats in the Convocation hall in the blocks earmarked for them. The recipients of University Medals will occupy seats in the front rows reserved for them. All present in the Convocation Hall will have to rise when the procession enters and leaves the Hall. Will be issued by the respective schools at designated counters from 10.00am to 10.30am. The recipients should be remain seated and observe complete silence. Since it is solemn occasion which requires a particular decorum, it is strongly advised to all recipients to keep their mobile phones in switched off/silent mode and refrain from using it. The recipients do not carry cameras and refrain from photography/ videography in the Convocation Hall. Maintain Silence and refrain from moving in and out of the Convocation Hall and cheer or shout in between award ceremony or during convocation address. They can show their enthusiasm and boost the morale of medal awardees by clapping. The photographs will be available in University website, after the convocation. The graduating student is required to complete online “Alumni Registration” before participating the Convocation ceremony. Lunch will be served after the Convocation, on production of lunch coupon/entry pass.